In most competitions the final match of the tournament bears the biggest reward. However when the OFC U-19 Championship semi-finals kick-off tomorrow at Stade Pater in Tahiti, for the four competing nations the result at the end of the 90 minutes means everything. The winners from each encounter, New Zealand vs. New Caledonia and Solomon Islands vs. Tahiti, will qualify for the FIFA U-20 World Cup in Poland – a momentous prize for whoever achieves it. The opening match will see New Zealand take on New Caledonia in a repeat of the semi-final of this same competition two years ago in Vanuatu. That encounter was won by the Kiwis 3-1 earning them qualification to the FIFA U-20 World Cup in Korea. However since then a large number of players from this New Caledonia squad have experienced a World Cup of their own, when they made their debut on the global stage at the FIFA U-17 World Cup in India last year. It’s an experience the Francophones are incredibly keen to repeat. “Neither of these teams are unworthy of their place,” New Caledonia coach Felix Tagawa said. “We know that we need to expect another difficult match because that’s the rivalry that exists between the Melanesian and Polynesian countries. Tagawa’s side have performed well over the course of their three group matches but the former Tahiti international is still expecting more. The opening loss to Solomon Islands was tough to take after a fantastic performance, and New Caledonia went on to absolutely dominate Vanuatu with an outstanding follow up match. The final Group B match against Fiji was a tight one which could have easily gone either way. It was an opportunity to once again see the skill this squad possesses with tight ball control and pinpoint passing a delight for any football fan to witness. Despite going a goal down, New Caledonia continued to push and although he had a penalty saved Cyril Drawilo managed to score an equaliser which was all the side needed to progress on goal difference. For New Zealand the path to the semi-final has been a little easier. Tahiti was a big first up test for the defending champions with the hosts pushing hard for a win. The Kiwis held them off to secure a 2-1 victory – conceding their only goal so far in the competition. Tonga were next and it was a 14 goal onslaught from New Zealand to boost their confidence ahead of what was expected to be a difficult final group game against Papua New Guinea. The first half had Papua New Guinea managing their experienced opponents well. However New Zealand eventually broke their opponents down managing to notch a 4-0 victory. Looking ahead New Zealand know they’re going up against a tough opponent in New Caledonia but have done everything in their power to prepare for the encounter. “From our end we’ve got control of what we have, everyone is available in terms of suspensions and everyone is fit and healthy,” coach Des Buckingham said. “We’ve been to all their games and we’ve been really impressed with the individuals they have and how they then come together as a collective. They’ve got some real threats across the pitch. The second semi-final will see Solomon Islands take on the hosts Tahiti at Stade Pater from 6.30pm. Like the game that precedes it, this is lining up to be tough encounter for both sides. Tahiti’s only loss in the group stage was against New Zealand in their opening match, and even that was by just a one goal deficit as they were beaten 2-1. The second game against Papua New Guinea was far from easy although Tahiti prevailed 4-0, it was a fiery match which saw the Melanesians reduced to eight men, while Tahiti lost one of their own players late in the piece as well. The final group game was against Tonga who, having suffered a 14-0 defeat to New Zealand earlier in the week, put forward a powerful final performance ahead of their return home. With the kick-off time moved forward three hours, Tahiti had to manage the encounter to contend with the heat and eventually managed a 2-0 victory over the Qualifier winners. Solomon Islands had a slightly smoother run to the semi-finals as they won three matches to top Group B with the full nine points. The opening match was a come from behind victory over New Caledonia in what was a tightly contested, action-packed 90 minutes of football. The best of both sides was on display as the Solomon Islands ran to a 3-2 win. The second encounter for Solomon Islands was another tough one, this time against Fiji. Again, the two sides were incredibly evenly-matched with just one late goal the difference between three points and none. 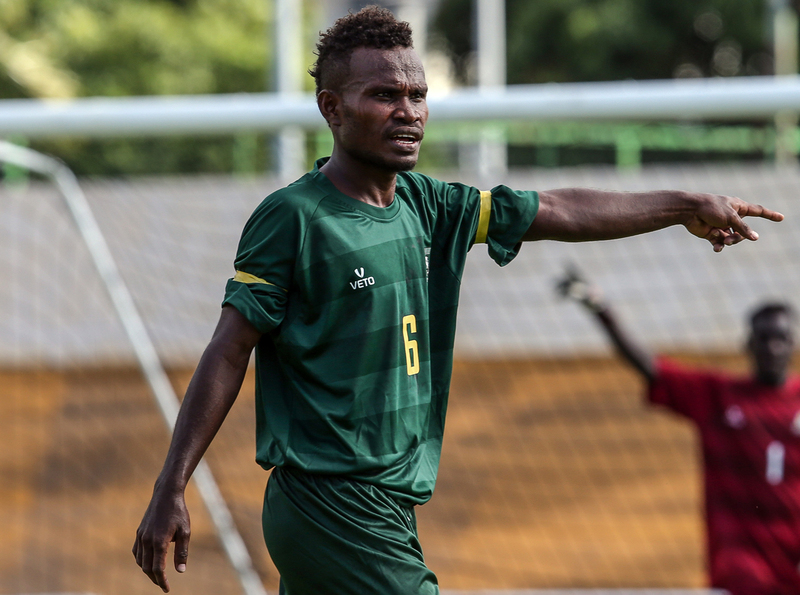 Solomon Islands played their final group match against Vanuatu, a side who had struggled to make an impact on the competition in their opening two games. However Vanuatu came out swinging as they used their last game to make an impact on the competition. Once again a lone goal, despite creating a plethora of opportunities, was all Solomon Islands needed to secure their place at the top of the group. Solomon Islands coach Batram Suri is excited about taking on the hosts in what he knows will be another tight match for his side. “We know Tahiti are playing at home which gives them an advantage. It will be a different challenge for us compared to what we have experienced in the Group Stage,” Suri stated. “The team is ready, we are all looking forward to the game as the atmosphere in the camp is in high spirit. Tahiti coach Bruno Tehaamoana is well aware of the threat the Solomon Islands pose to his side and their ambitions of securing a FIFA U-20 World Cup spot. “It’ll be 50-50 against the Solomons,” he said.